Once inside, you’re guaranteed a friendly welcome. Our team of four takes a great deal of pride in their quality of service as well as the rapport they build up with our many regulars. There’s a lot of experience within the team, so if you’ve any questions about any sort of product, please do ask. In store we carry a good selection of paints, wallpapers and decorating tools and equipment, and using our internet terminal you can browse wallpapers and designer paints too. Designed for the busy decorator, the Brewers 24 hour collection service uses a simple and secure lock box system. When ordering your goods with your local Brewers, you'll be sent a code (unique to your order) by SMS so that you can access the secure lock box at a time that suits you. 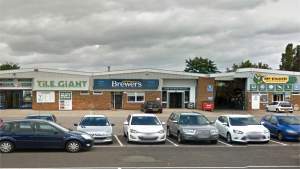 The Brewers Decorator Centre in Sittingbourne is on the B2005 as you head out of Sittingbourne towards Milton Creek Country Park. We’re directly opposite Asda, so you can’t miss us. There’s ample customer parking right outside, including dedicated disabled parking, and the store is easy to negotiate for those with reduced mobility. Head east on St Paul's/B2006, at the roundabout take the second exit onto Mill Way, follow this road and the store is located on the left. Head north on Mill Way/B2006, at the roundabout take the third exit onto Mill Way, follow this road and the store is located on the left. Head south on Grovehurst Road, at the roundabout take the first exit onto Saffron Way, shortly after there is another roundabout, take the first exit and the store is located on the right.